By Jeff Sorby: After a shaky start in the first three rounds tonight, Carl Frampton (16-0, 11 KO’s) came on strong to dominate and stop EBU super bantamweight champion Kiko Martinez (27-4, 19 KO’s) by a 9th round TKO at the Odyssey Arena, Belfast, Northern Ireland, United Kingdom. Martinez ran into a right hand from Frampton in the 9th that put him down. The fight was then halted after Martinez got back to his feet but was too hurt to continue. 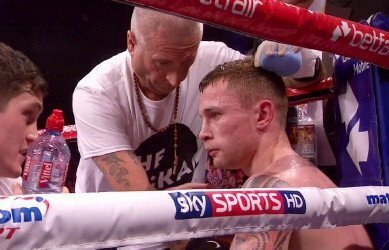 Frampton spent much of the fight moving around the ring, clinching, ducking below the waist, and trying to avoid the pressure from Martinez. Frampton didn’t look all that impressive before getting the stoppage, and it’s hard to imagine Frampton competing with the likes of Guillermo Rigondeux and Nonito Donaire, which is something he wants to do starting in 2014. Based on his performance tonight, I think Frampton’s going to need to wait them out until they either move up in weight or age to where they’re no longer dangerous. Martinez was pressuring Frampton all throughout the fight and was clearly the bigger puncher of the two. Frampton was able to get the better of him in most rounds by hitting and moving, as well as ducking below the waist to keep from getting hit. The referee kept warning Frampton about making this move but he kept doing it throughout the fight. In a one-sided fight, British and Commonwealth featherweight champion Lee Selby (14-1, 5 KO’s) defeated Martin Lindsay (20-2, 7 KO’s) by a 12 round unanimous decision by the scores of 118-110, 117-111 and 118-109. Selby looked like a welterweight after having rehydrated 126. If Selby wasn’t at 147, then he had to have been near that mark because he looked like a young Oscar De La Hoya in the ring with someone WAY too small for him to be fighting. The fight was hopefully one-sided from start to finish with Selby beating Lindsay on size alone. Selby looked like he was just playing with him for most of the fight until briefly getting serious with Lindsay in the 11th round after getting hit with a flurry of hard shots from Lindsay. Selby then turned it on and had Lindsay close to being stopped. Selby needs to move up to the European level because he’s wasting his time defending his British and Commonwealth titles against weak domestic level competition that isn’t helping him get better. He may choose to defend his British title once more, but he really shouldn’t. He’s good enough to compete for the European featherweight title right now and get better paydays. Fighting with new trainer Adam Booth, middleweight contender Andy Lee (29-2, 20 KO’s) battled hard to win a 10 round points decision win over Anthony Fitzgerald (13-4, 4 KO’s) in a fight that left more questions about Lee’s career than answers. Lee was able to outwork Fitzgerald in the fight, but he took a lot of shots in the first three rounds of the fight. Fitzgerald, a fighter without much power to speak of, was able to back Lee up to the ropes and keep him there for long periods. Luckily for Lee, Fitzgerald faded after the 4th because he would have had big problems had he continued to fight hard for the full 10 rounds. Lee’s trainer Emanuel Steward passed away recently, and he moved his operation back to the UK to try and restart his career. Lee was stopped in his previous fight agaisnt former WBC middleweight champion Julio Cesar Chavez Jr. last year in June. Lee’s fans belt that Chavez Jr. won only because he had a huge weight advantage. However, in looking at Lee struggle against 2nd tier fighter his own size tonight in Fitzgerald, you really can’t blame Lee’s loss to Chavez Jr. due to his being out-sized. The size might have been a factor, but the better explanation is the fact that Lee can’t handle pressure very well, and his weak legs make it easy for him to get bulled to the ropes where he lets himself get caught in wars on the inside. Lee needs to think about either retiring or being satisfied as domestic level champion.